TechFindings: RPC:0x800706D9: There are no more endpoints available from the endpoint mapper. RPC:0x800706D9: There are no more endpoints available from the endpoint mapper. 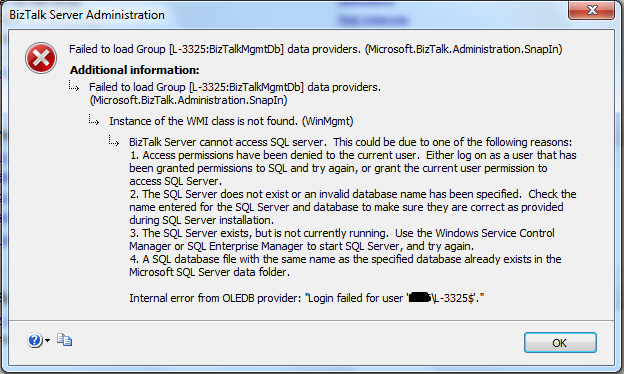 Today, it was the BizTalk admin console trying to play with me, when I opened the admin console, found that am not connected to any BizTalk group. "Enterprise Single Sign-On Service" gets installed while installation of BizTalk and it is there we have to specify the user account name, under which this service will run. That user account should have administrative privileges on the machine else SSO service will not start. And It is mandatory to have as all the configurations are stored in it. In my case it was the change in the password (which was part of company policy) which made this service stop and group unavailable. So I needed to reset the credentials for this service. Labels: BizTalk Error, Failed to load group, RPC:0x800706D9: There are no more endpoints available from the endpoint mapper.